Weaving first appeared in this region after agricultural settlements had been developed. An agricultural settlement was necessary for the development of the craft because flax and wool are essential resources in the weaving process. Growing flax and raising sheep was not an easy task in this region because of the nature of the land. When the settlement was started, the Maritime region consisted of rocky, wood- covered land, which is not ideal for growing flax or raising sheep. Sheep were especially difficult to raise because of the many predators that could destroy a flock overnight. Once the communities were established, flax became a yearly crop and was used in making linen. Coarser linens were made for heavier use and fine linen was made for domestic use. However, the vast majority of the linen woven was for ship sails. The most important tool in the weaving process is the loom. The loom used at Sherbrooke Village is a four- harness loom and each of the four harnesses is connected to treadles under the loom. When setting up the loom, the warp is wound around a post at the front of the loom, strung through the eyes of each harness, and through the reeds of the beater. When a set of treadles are pushed down, a space for the shuttle to pass through is made. The shuttle is made from wood and holds a bobbin wound with the weft threads. 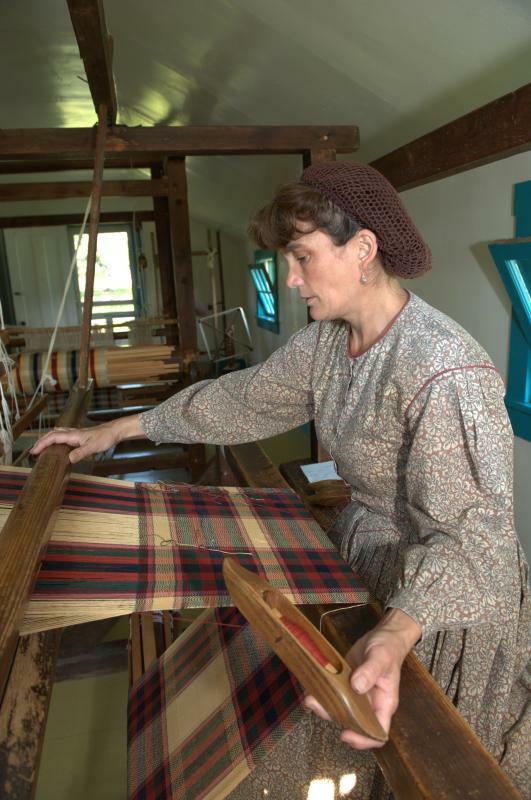 The weavers of Sherbrooke Village make anything from placemats to coverlets for a bed. Visitors are welcome to watch the weaving process at the Temperance Hall and view the finished products at the Company Store.